This is a photograph of my cat, Ashley. This article is about her breed. 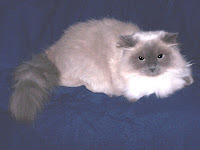 In the USA they are known as Himalayans, nicknamed Himmies, and in Europe they are called Colorpoint Persians. The first deliberate attempt to cross a Siamese with a Persian cat was done in 1924 by for Swedish geneticist. Much was to be learned about the genetic characteristics of cats's bodies and coat colors. Long hair and Color Points were discovered to both be recessive traits. It wasn't until 1935 that a kitten was produced that looked like the Himalayans or Colorpoint Persians of today. This "new" breed of cat was officially recognized by the GCCF (Governing Council of Cat Fancy) of England in 1955 and by the CFA (Cat Fanciers Association) in the USA in 1957. The CFA began allowing competition of Himmies as a sub-group within the Persian classification. The TICA (The International Cat Association) classifies this breed as unique and separate from the Persians. The white or cream-colored bodies of Himmies are medium to large in size, sometimes weighing up to 12 pounds. They have short legs which sometimes restricts how high they can jump. They have darker fur on the face, ears, legs and tail. Their fur is very long, especially on the tail. The original "Himmies" had seal, blue, chocolate and lilac points. Today's cats can be solid color, tabby-striped or tortoise-shelled. The colors come in chocolate, seal, lilac, blue, red/flame, cream-tortie, blue-cream, chocolate-tortie, lilac-cream, seal lynx, blue lynx, red lynx, cream lynx, tortie lynx, blue-cream lynx, chocolate lynx, lilac lynx, chocolate-tortie lynx and lilac-cream lynx colors. There are two kinds of faces. "Peeked" or "Ultra" faced Himmies have squashed in faces, a frown look to the mouth and squinty eyes. "Doll Face" Himmies have large, round eyes and a little bit of elongation of the muzzle. Over the generations, Himmies tend back to longer snouts, so every once in awhile a Persian needs to be bred into the line to keep the flat face. Inbreeding has caused some genetic problems - breathing problems called Brachycephalia due to the flat face (flat faced dogs have the same problem), some joint problems, organ abnormalities, Polycystic Kidney Disease and Progressive Retinal Atrophy. Not all Himmies get these problems. Himalayans were named after Himalayan rabbits that had the same color point coat. That's how they got their name. They originated in England, not the mountains of Asia. The personality of a Himalayan is very gentle and sedate, but not so lethargic as a Persian. They have their frisky moments and like to play. The tend to love human companionship and want to be in the same room, if not right there in your lap. They tend not to be as independant or aloof as other breeds. Himalayan cats need their humans to help care for their eyes and coats. Their fur needs to be brushed every day and they need regular baths, once a week sometimes. Their eyes tend to tear which results in a build up of crust. Eyes need to be wiped clean every day. The presence of crust build up invites bacteria into the eye area which is dangerous to eye health. 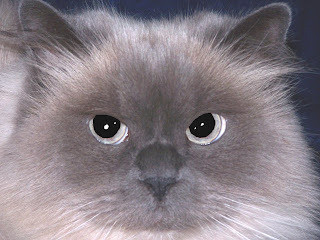 If you don't mind the brushing and bathing, a Himalayan cat can be a beautiful addition to your family. He or she will give you lots of love. Petting such a soft coat is relaxing and luxurious. I know - I've owned two Himalayans and they are right up there with diamonds, dark chocolate and silks. Well done! I've really enjoyed your article. In early 2008 I bought my first Persian (a solid white with copper eyes) and she is quickly turning me into a cat person!! Each country has its own rules and regulations on what constitutes a breed and what's required of that breed if you want to show your cat in competitions. England and the USA definitely have differing opinions. Not sure what Australia decided on the matter. She is gorgeous! 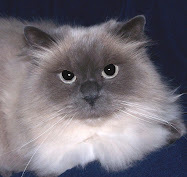 I rescued my Himalayan, Dear Prudence, when she was dumped by the side of the road by some jerk. She was the most beautiful thing with her perpetually grumpy face. I lost her to a brain tumor a couple years ago and miss her so much. I would love to get another Himmie someday. Thanks for sharing! Ashley's a beautiful cat! I enjoyed reading your article.